So sad to report our Sweet Chloe Died at age 7 unexpectedly 1/2019. 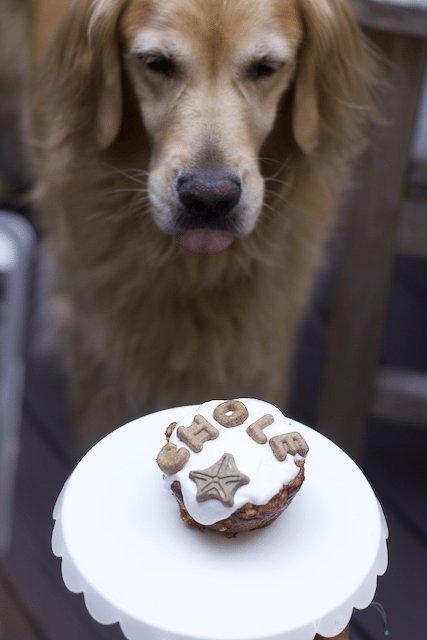 We hope that by continuing to share this Easy Four Ingredient Dog Birthday Cake for One we are sharing her memory. 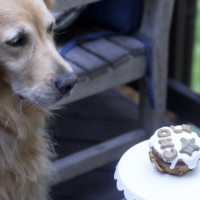 Do you bake a puppy cake for a dog birthday? This year our pup did not have her traditional dog birthday. I know it sounds crazy but I usually make a dog birthday cake or dog cupcake recipe. Give them to some of the neighbor dogs on her birthday which also happens to be National Dog Day. 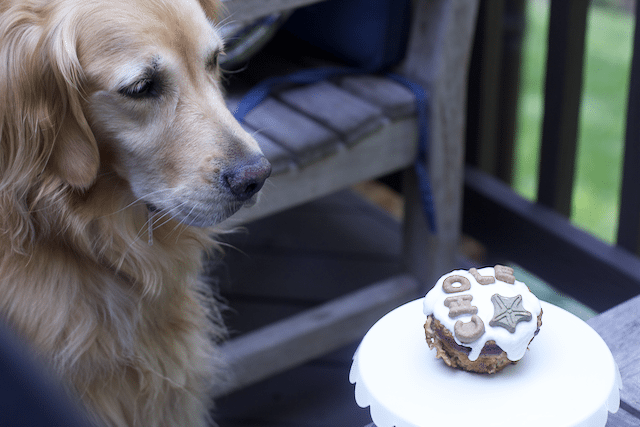 Don’t be shy to throw an inexpensive Birthday for your dog. 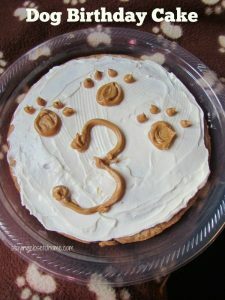 Knowing that most of her pup friends were out of town this year, I was thrilled to find an Impossibly Easy Four Ingredient Dog Birthday Cake for One. 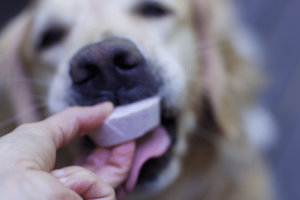 As much as Chloe would like to enjoy a piece of a dog safe cake daily, this was the best option to keep her weight in check. 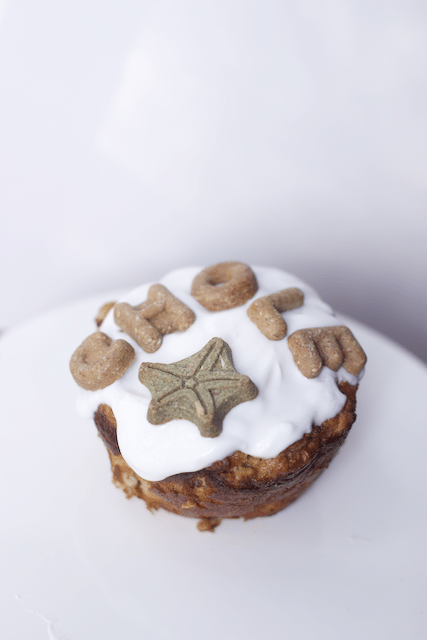 If your dog has grain issues, this is a grain free dog cake recipe! 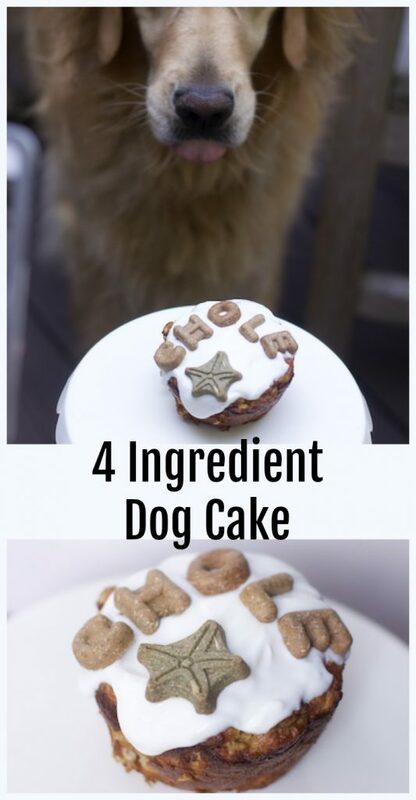 For this super simple dog cake you only need four ingredients. Most likely you have everything in your cupboard already. 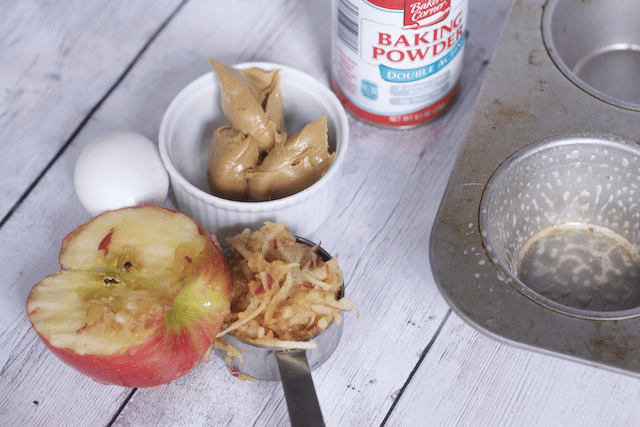 The most challenging part of this recipe is grating the apple. That was a joke people, not a hard task, my 11-year-old did this for us. This is also a grain free recipe in case your dog has any allergies. 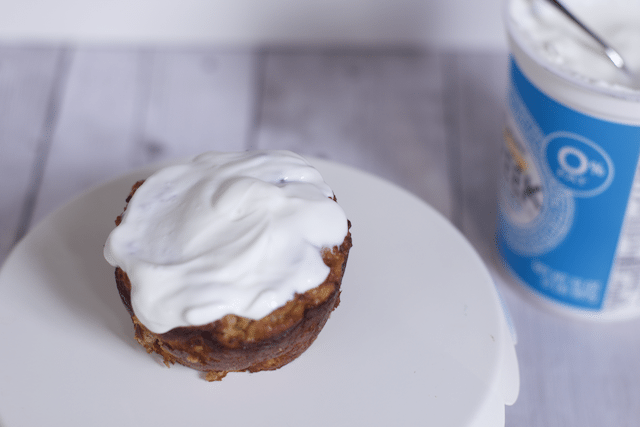 All you need to do is simply mix all the ingredients and dump it into a Jumbo cupcake tin. 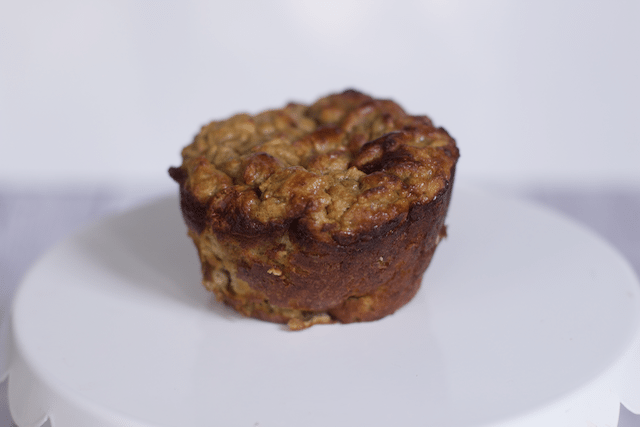 You could make two smaller muffins too if you wanted to use a regular size muffin tin. Just be sure to reduce the cooking time. Now for the dog cake decorations. 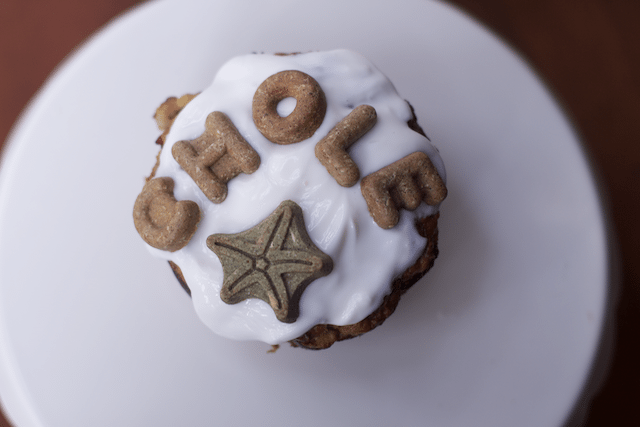 While this grain free dog cake would be easily devoured like this, my son and I found some fun alphabet dog treats and could not resist buying her name for a topping. For the dog cake frosting, we lathered a thin layer of Zero Fat Greek Yogurt on top of the dog birthday cake. It is always torture to get her to pose for pictures with something delicious in front of her. Check out the drool in this picture. 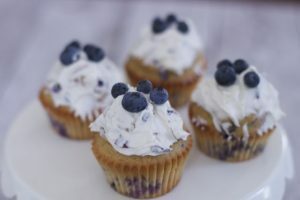 Be sure to check out our other Homemade Dog cakes and Dog Treats Recipes. 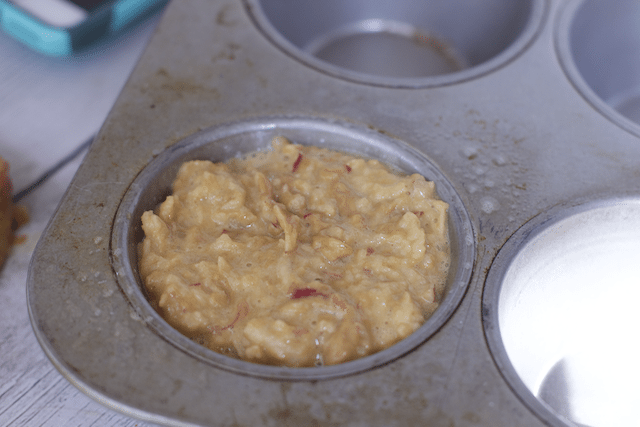 Grease a jumbo muffin tin. Fill with batter. Let cool for a couple minutes, then Cool on a cooling rack for 5 minutes before serving to your dog. Do you celebrate a dog birthday? If so what do you do for them? thanks lori, congrats on 15. your pup deserves 2 cupcakes. I do hope we have Chloe that long. Love this! We have a dog bday coming up next week – number 15! This is going on the menu. Such cute pics of your pup.